Natura® Tuscon takes rustic to a new level with the combined features of worn stone and elegant marble. Natural tone-on-tone colors and chiseled edges produce a rich depth - acheived through multiple glaze applications. The semi-matte surface has the advantage of easy maintenance. 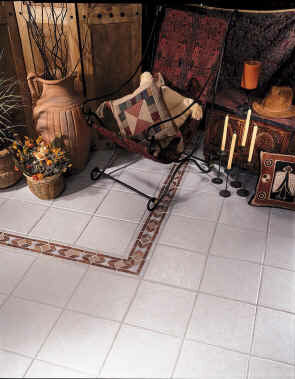 Tuscon is especially beautiful when accented with our Tumblestone listellos or TumbleTile series. This versatile floor tile series is the perfect choice for any interior application.